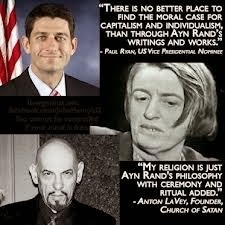 Today's post, "Republicans And Ayn Rand, A Love-Hate Affair," naturally follows yesterday's article, "The Sociopathic 1 Percent: The Driving Force at the Heart of the Tea Party," where we leaned that "selfishness is a virtue, and altruism a vice, as per Ayn Rand." 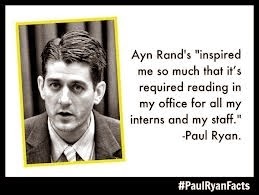 "House budget chairman Paul Ryan once credited the philosopher Ayn Rand for guiding him to public service. Now he's realizing she can be as much a curse as a blessing. "FORTUNE -- Paul Ryan is trying very hard to put daylight between himself and Ayn Rand, the right's leading advocate of selfishness, greed and laissez-faire capitalism. It's not working, but it's illuminating to explore why he's making such a fuss about Rand -- and why we all should do so. "The House Budget Committee chairman, whose soak-the-poor, cut-taxes-for-the-rich budget plan has drawn attention to his fealty to Rand, gave an interview to The National Review last week in which he made Rand seem like a casual reading experience and not the cornerstone of his belief system. 'You know you've arrived in politics when you have an urban legend about you, and this one is mine,' Ryan said of the foul calumny that he is a follower of Ayn Rand. "That much is true. 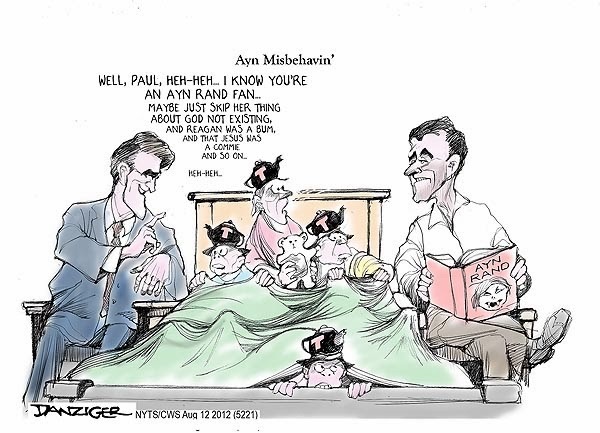 Her Objectivism certainly is atheistic, and that seems to be the reason Ryan is suddenly saying -- after years in which he has been publicly identified with Rand -- that he is shocked, shocked, that anyone would reach that conclusion. "Atheism is a crucial part of the teachings of the Russian-born philosopher, who died in 1982, and whose extremist writings have exploded in popularity in recent years. 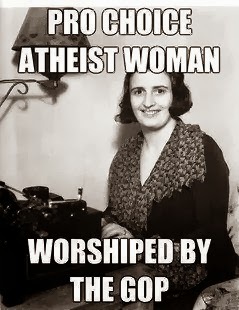 Her books and essays, especially her 1957 novel Atlas Shrugged, reject pretty much every major aspect of Judeo-Christian morality, especially its teachings on altruism (which she despised) and selfishness and greed (which she worshipped). "Ryan's denial seemed to work for a few days. Or at least it did until an audio recording of remarks made by Ryan was published on the Internet on Monday by The Atlas Society, an organization devoted to the propagation of Rand's views. Ryan was taped while he was speaking to an Atlas Society gathering in 2005. The Randians, it seems, were peeved by Ryan's efforts to repudiate the goddess of capitalism, and they had in their possession the best possible refutation of his denials -- his own words. ". . . But the reason I got involved in public service, by and large, if I had to credit one thinker, one person, it would be Ayn Rand. And the fight we are in here, make no mistake about it, is a fight of individualism versus collectivism," said Ryan in 2005, utilizing some favorite Objectivist catchphrases. "'It's so important that we go back to our roots to look at Ayn Rand's vision, her writings, to see what our girding, under-grounding [sic] principles are. I always go back to, you know, Francisco d'Anconia's speech (at Bill Taggart's wedding) on money when I think about monetary policy,' he said. And on he went, sounding very much like the Rand devotee that he has been accurately described as being in press accounts. "This is more than just another Marx Brothers moment (as in the line from Duck Soup: "Who are you going to believe, me or your own two eyes?") It's actually a very real case of déjà vu. In recent years, another Rand acolyte -- Alan Greenspan -- has gone through even more violent gyrations to separate himself from Rand. "Greenspan had an even more difficult job than Ryan, because he was a member of Rand's inner circle, known as the 'Collective,' during the early 1950s. He wrote essays for Rand's newsletters, including one in which he espoused an extremist vision of capitalism, in which all forms of regulation, even building codes, would become a thing of the past. That essay, written in 1963, was published in an anthology called Capitalism: The Unknown Ideal, which is still in print. "This came to be known as the 'flaw speech,' and it was one of the seminal moments of the financial crisis. An architect of deregulation, Greenspan, partly responsible for both the repeal of Glass-Steagall and the failure to regulate derivatives, had actually admitted that he was wrong. Or had he? 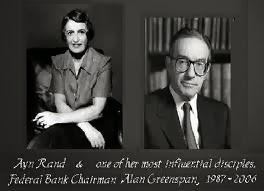 "When I combed through Greenspan's testimony and his other public statements, in researching my recent book Ayn Rand Nation, I found that the 'flaw speech' was less a mea culpa than it was a public relations exercise. He backtracked on his 'flaw' remarks almost as soon as he made them, and he contradicted them at every opportunity. In one broadcast appearance in April 2010, he was asked if the market crisis had repudiated laissez-faire capitalism or Ayn Rand's belief that the markets can be trusted to police themselves. His response: 'Not at all.' Greenspan made a similar flip-flop in an appearance before the Financial Crisis Inquiry Commission, saying that 'the flaw in the system that I acknowledged [in 2008] was inability to fully understand the state and extent of potential risks that were as yet untested.' It was another Marx Brothers moment, and it went by virtually unnoticed. "Ryan has an even more urgent reason to distance himself from Rand. He stands a reasonable chance of getting the Republican vice-presidential nomination, and possibly running for president himself in the future. And that is where Rand can be as much a curse as a blessing. Although her philosophy has a strong appeal to the Republican right, her atheism -- and her support of abortion rights -- puts her at odds with the Christian right. My interviews for the book with Tea Party activists found that Rand's atheism remains a serious obstacle in acceptance of her views by the rank-and-file, despite the 'Ayn Rand is right' signs at Tea Party rallies. "This presents an opportunity for those of us who don't share Rand's extremist vision of capitalism. 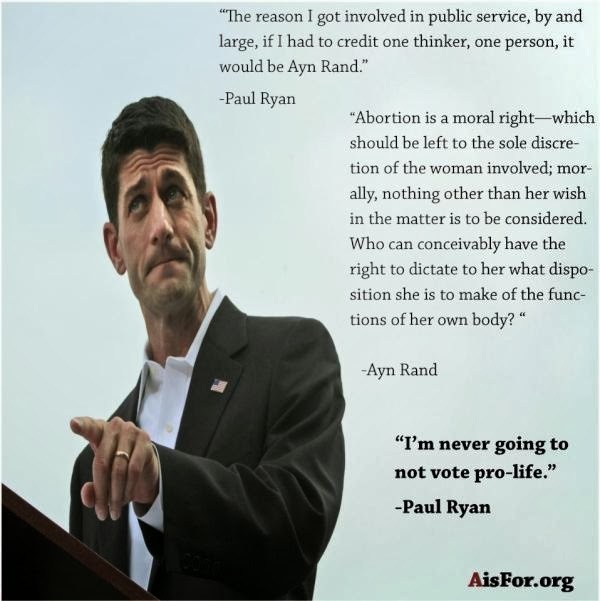 Her philosophy cannot be disentangled from atheism, no matter how strenuously followers like Ryan may try to do so, because her support of greed and selfishness could not exist in a worldview that cherishes Judeo-Christian values. It is a 'flaw,' as Alan Greenspan would put it. And no amount of flip-flopping and insincere denials can make it go away." "(T)he self-interest of lending institutions to protect shareholders' equity." No matter how many times Mrs. Greenspan's little boy Hymie took it back -- no backsies, Hymie! Can you spell h-y-p-o-c-r-i-s-y? Conservatives don't often "take it back," unless we count how many times Romney took it back, or how many times Conservatives throughout our history have taken it back. We remember however, How Alan Greenspan Destroyed America and that Conservatives Once Ridiculed Ayn Rand! The 2016 election will be a Conservative play on "backsies." Will they disavow Romney's 47 percent line? Will they still maintain that the upper class has an inborn right to govern the rest of us? 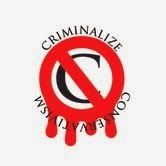 No matter how you cut it, slice it, or dice it, they are all liars and it's high time we outlawed the criminal conspiracy called...Conservatism. Failed GOP candidate for President, businessman Herman Cain.